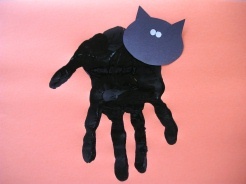 This Hand Print Black Cat is a great Halloween Craft for toddlers on up. They can dip their hand in the paint and you can add the cat's face! 1. Pour some black paint onto a paper plate. Dip a hand into the paint and smoosh it on to a piece of orange paper. Turn the paper around so the cat's legs are facing down. 2. Cut a cats face from black construction paper. Make eyes by gluing on white circles or google eyes, or you can always draw them on with a white crayon or pencil. Glue the cat's face onto the hand print. Another, less messier, option is to trace the hand print on black construction paper and cut out.